Departing from conventional wisdom, behaviour is about acting in order to perceive the world as we want it, not about reacting to stimuli or predicting appropriate outputs. Traditional approaches to behaviour, Computational Artificial Intelligence, Behavior-based Robotics and Cognitive Psychology, have fundamentally misunderstood the nature of behaviour within living systems. Rather than behavioural output being defined, or computed, from cognitive models based upon perception, that output is varied in order to keep the perceptual input at desired values. In other words, behaviour is about controlling the way we perceive the world. 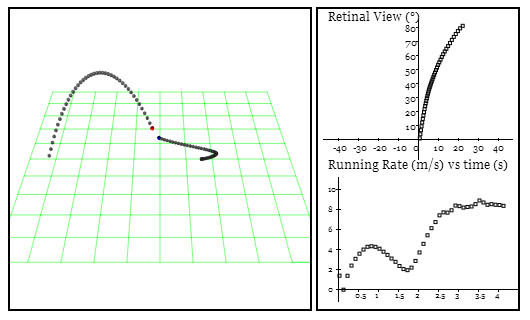 For example, catching a baseball is not about the computation of trajectories and intercept points, but merely about keeping the speed of the ball on the retina constant. The Prediction Fallacy. Complex behaviour derives not from predictive models, but from simple perceptual control.Try out the demo for yourself at goo.gl/jBOcmQ. As it is not action but the consequences of action that are being controlled there is no need for complex internal models of the external world. This, along with the simplicity of the basic perceptual control process, means that the architecture required to build robotics systems avoids the usual complexities and is greatly simplified. The paper below gives an overview of the perceptual control architecture for robotics systems along with an implementation on a robotic rover that exhibits emergent behaviours which are complex relative to the simplicity of the methodology. Perceptual control systems adapt autonomously to real-world circumstances. The process of perceptual control holds the promise of furnishing an organizing principle of behaviour that differentiates living from non-living systems, providing the missing ‘stuff’ of Artificial Life systems. One significant implication of this approach is that it has the potential to clear the blockage of progressing robotics systems from simulations and highly-controlled conditions to the real world. At the heart of the Perceptual Control architecture is a simple, universal feedback process that applies to all levels and types of behaviour. That process is inherently adaptive and able to counter the unknown disturbances of the real world. When arranged in a hierarchy the basic process enables the complexity of behaviour observed in living systems. As the basic operation is to bring the perception to match an internal, desired value this embodies the system with purpose. Complex behaviour arises from a multitude of simple perceptual controllers. This entry was posted in PCT, Robotics, Summary. Bookmark the permalink.